Backglass: Beach scene of swimsuit clad people playing with a beach ball. The artwork is in the common late 60s/early 70s sharp angled style. 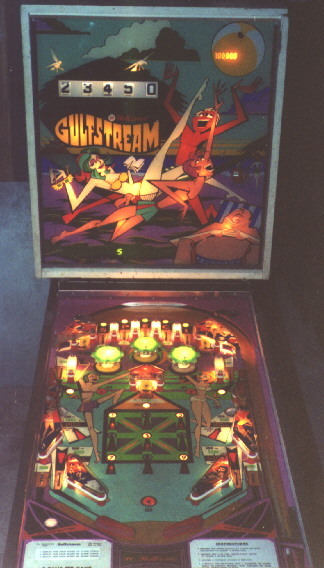 Playfield: Symmetrical layout with three jet bumpers just below the top rollover lanes. A center standup target spots positions on a tic-tac-toe grid in the center of the playfield. One lane is on each side of the upper playfield. All lanes together spell S-P-E-C-I-A-L. Cabinet: Colors are green and orange on a white background. The stenciled shapes are beach goers playing with a beach ball. It's one of those few electro-mechanical machines that play much better with a steep playfield angle. The play is very simple--earn an extra ball by scoring either special. One special is lit by completing three-in-a-row on the tic-tac-toe grid. The other is lit by lighting each letter in each lane. This game was made during the period when manufacturers were pushing games out as fast as possible. Because of this many of the machines were very simple and had similar layout and play appeal to other machines of the same time. In a sense many of these machines are considered rather bland. This machine is not yet considered very collectible. I have owned two of these machines. The latest was in rough mechanical shape and had a shattered backglass. I was able to obtain a new backglass in excellent condition and restore it to good working condition.